Any metric that is measured over regular time intervals forms a time series. Analysis of time series is commercially importance because of industrial need and relevance especially w.r.t forecasting (demand, sales, supply etc). What is auto correlation etc. What is a Time Series ? Any metric that is measured over regular time intervals makes a Time Series. Example: Weather data, Stock prices, Industry forecasts, etc are some of the common ones. How to create a Time Series in R ? Upon importing your data into R, use ts() function as follows. The inputData used here is ideally a numeric vector of the class ‘numeric’ or ‘integer’. ts (1:10, frequency = 12, start = 1990) # freq 12 => Monthly data. Each data point (Yt) at time t in a Time Series can be expressed as either a sum or a product of 3 components, namely, Seasonality (St), Trend (Tt) and Error (et) (a.k.a White Noise). 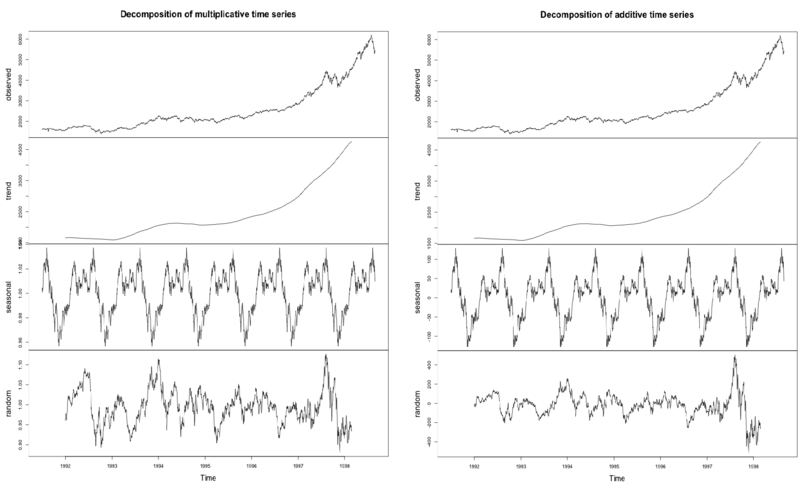 A multiplicative time series can be converted to additive by taking a log of the time series. What is a Stationary Time Series ? A time series is said to be stationary if it holds the following conditions true. The mean value of time-series is constant over time, which implies, the trend component is nullified. The variance does not increase over time. This means it is devoid of trend or seasonal patterns, which makes it looks like a random white noise irrespective of the observed time interval. How to extract the trend, seasonality and error? The decompose() and forecast::stl() splits the time series into seasonality, trend and error components. How to create lags of a time-series ? When the time base is shifted by a given number of periods, a Lag of time series is created. Lags of a time series are often used as explanatory variables to model the actual time series itself. The underlying reasoning is that the state of the time series few periods back may still has an influence on the series current state. laggedTS <- lag(tsData, 3) # shifted 3 periods earlier. Use `-3` to shift by 3 periods forward. What is Autocorrelation and Partial-Autocorrelation? It shows if the previous states (lagged observations) of the time series has an influence on the current state. In the autocorrelation chart, if the autocorrelation crosses the dashed blue line, it means that specific lag is significantly correlated with current series. 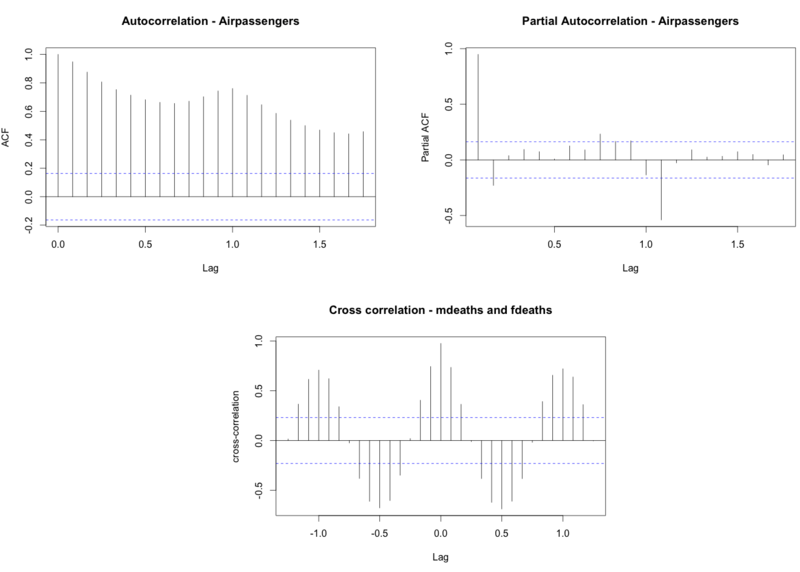 For example, in autocorrelation chart of AirPassengers - the top-left chart (below), there is significant autocorrelation for all the lags shown on x-axis. It is used commonly to determine if the time series is stationary or not. A stationary time series will have the autocorrelation fall to zero fairly quickly but for a non-stationary series it drops gradually. Partial Autocorrelation is the correlation of the time series with a lag of itself, with the linear dependence of all the lags between them removed. ccfRes <- ccf(mdeaths, fdeaths, ylab = "cross-correlation") # computes cross correlation between 2 timeseries. How to de-trend a time series ? Use linear regression to model the Time Series data with linear indices (Ex: 1, 2, .. n). The resulting model’s residuals is a representation of the time series devoid of the trend. In case, if some trend is left over to be seen in the residuals (like what it seems to be with ‘JohnsonJohnson’ data below), then you might wish to add few predictors to the lm() call (like a forecast::seasonaldummy, forecast::fourier or may be a lag of the series itself), until the trend is filtered. plot(resid(trModel), type="l")  # resid(trModel) contains the de-trended series. 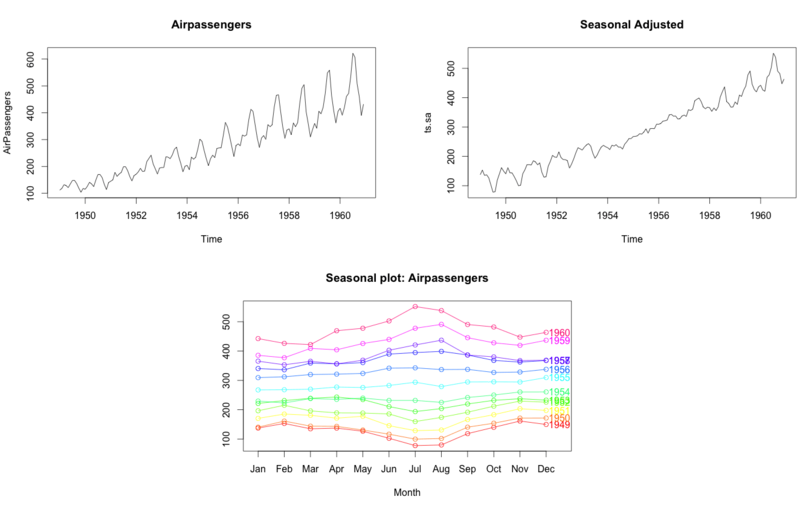 How to de-seasonalize a time series in R? seasonplot(ts.sa, 12, col=rainbow(12), year.labels=TRUE, main="Seasonal plot: Airpassengers") # seasonal frequency set as 12 for monthly data. How to test if a time series is stationary? Use Augmented Dickey-Fuller Test (adf test). A p-Value of less than 0.05 in adf.test() indicates that it is stationary. How to make a time series stationary? Differencing a time series means, to subtract each data point in the series from its successor. It is commonly used to make a time series stationary. For most time series patterns, 1 or 2 differencing is necessary to make it a stationary series. But if the time series appears to be seasonal, a better approach is to difference with respective season’s data points to remove seasonal effect. After that, if needed, difference it again with successive data points. But, How to know how many differencing is needed? the nsdiffs and ndiffs from forecast package can help find out how many seasonal differencing and regular differencing respectively is needed to make the series stationary. plot(ap_seasdiff, type="l", main="Seasonally Differenced")  # still not stationary!